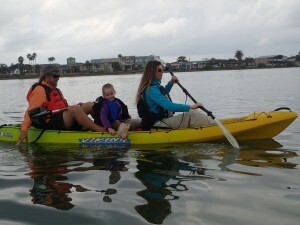 Kayaking is an outdoor sport, and requires physical exertion. You will be exposed to sun, wind, rain, waves, etc. sometimes all at once. As such, there are inherent risks. Tides, wind, and waves may make navigation difficult so check the weather both before launch time and during your trip. You will get wet from splashing paddles, waves, or rain. 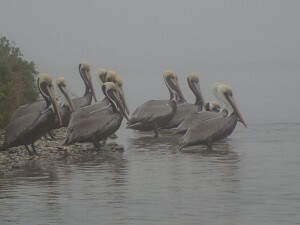 Various hazards exist in the water, including oyster beds and wildlife. All are easy to avoid if you pay attention. Mud flats can be difficult to navigate on foot. Should you decide to step out of your kayak, check the firmness of the bottom with your paddle first. Bring enough food and/or snacks for the duration of your trip. Wear lightweight clothing that covers your arms and legs and a hat in the summer. Wear warm clothing that is wind and waterproof in the cooler months. Bring sun protection (even in the cooler months) such as sunscreen or protective clothing. Wear proper footgear (not flip flops) that can stay secure on your feet and protect the tops of your feet from the sun. Place any items (cell phones, key fobs, cameras, etc.) that are NOT waterproof that you plan on bringing with you into a heavy-duty Zip-seal bag.